Just nine days after his sixth birthday, the pediatrician had Jennifer take Cayden for a lab workup. Minutes after leaving the clinic, Jennifer’s phone rang. Cayden’s platelet count was 7. “Pack a bag for Cayden and make arrangements for your other children – you’re going somewhere tonight,” the doctor said. “I panicked,” Jennifer said. “After 16 years in the medical field, I know too much - I just knew he had leukemia…” until their appointment early the next morning. After examining Cayden’s platelets, the doctor at Children’s Hospital of Wisconsin told them that because Cayden’s platelets were so large, he was sure it was not leukemia. “Then he said, ‘I know exactly what this is’,” continued Jennifer. And Cayden’s ITP journey began… ten days of prednisone with counts spiking to 110, bottoming out, spiking back up to 70, and bottoming out yet again. 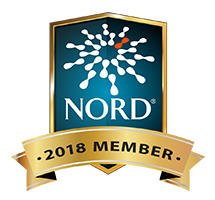 Then, they administered IVIG and although his counts still fluctuated, immunoglobulin therapy approximately every three to four weeks helped better manage Cayden’s counts and eliminated the need for long-term steroid use. Fourteen or fifteen months into his journey, unbeknownst to Jennifer, Cayden bumped his head on a low ceiling. Cayden was covered in bruises and since they had a standing CBC order, Jennifer took him to be tested. Leaving the clinic, she noticed a large bump on his head and asked him what happened. Once again, as a mom, Jennifer did her best not to panic, but as a nurse knew she must monitor his condition. Later that evening, a headache and vomiting developed and Jennifer wasted no time calling the doctor. An MRI showed a slight bleed in the brain and Cayden’s platelet count was five so IVIG was administered promptly to bring up his count. He spent two nights in the hospital with two more rounds of IVIG and added another episode to his growing list of triumphs over ITP. Like any great warrior, Cayden is surrounded by a contingent of allies and equipped with the essential tools that foster the strength required to beat ITP. In addition to his family, Cayden has been blessed with an outpouring of support from the local community. There was the fundraiser held at Turner High School to help support medical costs and the gift of his service dog, Feather – a retired golden retriever show dog who has been trained to detect a low platelet count. Heartened by these actions, last year the Kruegers organized the 1st annual Pump It Up For Platelets! event in Beloit, WI. Their goal was to raise $1,000 and they hoped for at least twenty people to attend, but little did they know that they had set the bar far too low. Their event raised over $10,000 with over 200 people in attendance. “That was bigger to me than my son having ITP because we want people to know about ITP. We want a cure,” continued Jennifer and support for this little ITP Warrior did not end there. Instead, it was just the beginning. Inspired by his story and impressed by his eagerness to give back, Cayden was selected as the 2017 Shopko Kick Off Kid and was offered tickets to attend a Packers game, complete with an Aaron Rogers jersey and a $500 donation to PDSA. Cayden’s response wasn’t much different than any fan, “Are you serious?! I get to run out on Lambeau field? !” Wearing his Packers jersey and sporting his signature purple mohawk, Cayden was escorted down to field level for the big game. He ran out to center field, picked up the kick-off tee, was scooped up by coach Mike McCarthy for a round of high fives from the whole team and hung out with Clay Matthews on the side line. 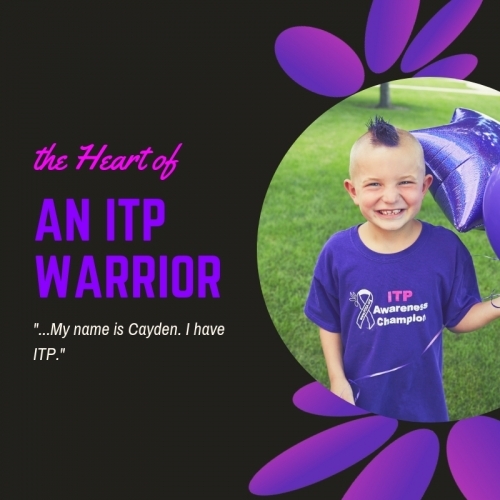 As pictures of Cayden flashed on the jumbotron, the crowd cheered and something even more wonderful happened – that little boy who had been stripped of his childhood by ITP was now part of the game. For this moment, this little ITP Warrior was just Cayden - a little boy living his dream - standing on the side line of a football field. The sweetest victories frequently emerge from life’s most difficult struggles. Has immune thrombocytopenia soured your journey? Refer to a page from Cayden’s playbook – take back the wheel and redirect the course. Be empowered. Celebrate life’s simple pleasures, share some love, stay strong and BEAT ITP!